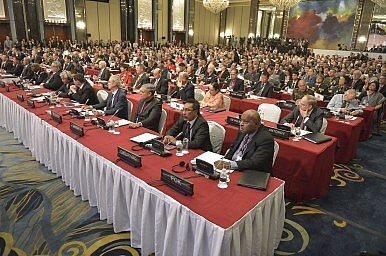 Audience members at the 2015 Shangri-La Dialogue. China was once again the odd country out this year, the only major Asia-Pacific power not to send its minister of defense to attend the Shangri-La Dialogue. United States Secretary of Defense Ashton Cater made the trip, as did the defense ministers of Cambodia, Germany. Indonesia, India, Japan, Malaysia, New Zealand, Singapore, and the U.K. Sun, with a rank equivalent to a regional military commander, is of decidedly lower status (although, according to Bo Zhiyue, Sun is a top contender for the post of PLA Navy commander in 2017). China has only sent its defense minister to the Dialogue once, when then- Chinese Defense Minister Liang Guanglie attended in 2011 and held bilateral meetings with other officials. That was apparently an exception, not a new precedent for China – in the years since, China has returned to form, sending lower-level military officers to the region’s top security forum. From 2013-2015, China’s representatives were all deputy chief of General Staff, and in 2012 China’s leading delegate had an even lower rank — Ren Haiquan, the vice president of the Academy of Military Science, was the top attendee for Beijing. China has also sent different officials each time. Though Chinese officials often continues cite a lack of experience on the international stage as their explanation for underwhelming performances, there seems to be little interest in building up that experience through repeat appearances at the Shangri-La Dialogue. Given the background, there’s generally little expectation that China’s representatives will say anything new during the Dialogue. Their main function is to repeat the Chinese Communist Party line and provide a defense of China’s perspective on regional security (often including justifications for China’s actions after weathering criticism in speeches from other regional leaders). Sun’s speech was no exception. As Bonnie Glaser of CSIS noted, Sun even kept with him “a briefing book… with multiple tabs so he could easily access and recite Chinese policy on any issue” that he used in answering each question put to him by conference attendees. Sun was there to recite existing policy, not to provide new context or explanations for China’s actions (much less announcing a new approach to security issues). So what was Sun’s message? He strongly emphasized, as Chinese officials have for years, China’s commitment to “the path of peaceful development” and to “regional and international prosperity and stability.” The takeaway here is that China’s national security moves are always “defensive” and that other countries have nothing to fear from China’s rise. He contrasted China’s vision of “win-win cooperation and a new model of international relations” with “outdated thinking from the age of colonial expansion or the zero-sum mentality of the Cold War” (a charge usually leveled at the United States, although Sun left it vague here). On the South China Sea in particular, Sun tried to cast China as a model of forbearance: “In spite of the sufficient historical and legal evidence and its indisputable claims of rights and interests, China has exercised enormous restraint, making positive contributions to peace and stability of the region and the world at large.” His explanation for China’s construction projects in the South China Sea are taken almost verbatim from previous Foreign Ministry press conferences and other official proclamations. Sun did take more time than normal to emphasize that China’s land reclamation and construction activities will not “affect the freedom of navigation” in the South China Sea, but when pushed on this issue during the question and answer session he refused to explain further. The issue with the Shangri-La Dialogue speech, which Glaser called a “missed opportunity” for China, is not unique to Sun. The Chinese government places a heavy emphasis on specific jargon; phrases such as “win-win cooperation,” “peaceful development,” and “community of common destiny” are virtually guaranteed to show up in any foreign policy speech. Pull out your handy “Chinese foreign policy slogans” bingo card, and you can practically write a speech like Sun’s yourself. But officials — even Xi Jinping himself — rarely do anything more than repeating those phrases as a broad statement of Chinese policy, leaving confusion about how, exactly, those phrases are borne out in China’s policymaking decisions. Anyone who expects clarity on that front from China, particularly on a thorny issue like the South China Sea, is due for a disappointment.